It has been five years since we were graciously and mercifully received into the Mission Society of St. Gregorios of India, Malankara Orthodox Syrian Church, as priest and parish. Your prayers, your best wishes, your support, your donations, your advice and your love have given us hope, courage and strength over these five years of sometimes challenging ministry and mission work in middle America. Our mission parish congregation is blessed with members of diverse heritage from around the world. It is our hope that diverse and mixed Orthodox Christian congregations in America will thrive as a demonstration of Orthodox unity and God�s merciful gift of the Church to all people regardless of race or heritage. You, your family, loved ones and acquaintances are invited to our annual Transfiguration festival celebration and picnic, August 13, 2006. Sunday services start at 9:00 am, followed by the traditional blessing of fruit and the picnic at noon. If you haven�t been able to be with us for awhile, we hope you can make the effort to join us in this celebration. Accommodations and rides can be arranged. Whether or not you can come, perhaps you would like to contribute to a booklet of �best wishes� and other kind thoughts and memories of our mission effort. We hope to have a little souvenir published with some pictures, some of our stories and your best wishes and/or memories. Just send us an email or letter with "best wishes on your 5th anniversary" (or something like that) so we will be able to recognize your intention to be included in book(let). As a token of our anniversary and our mission efforts, we have lapel pins for you by request for any donation. 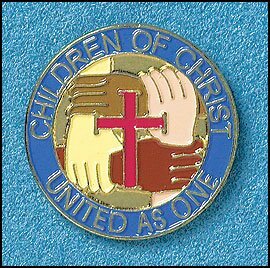 They are 1 inch diameter full-color enameled pins, with "Children of Christ - United As One" and four hands (representing four racial distinctions) interlocked around a red cross (see enlarged image below or attached). 100% of the proceeds will go toward our mission, the chapel and its future. May they be a blessing to you as you are to our mission efforts. Please remember us in your prayers and, if you are able, any donation to our efforts that would be appreciated.